← Aurora Voting Final Day! 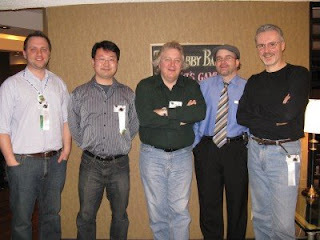 The 2008 Prix Aurora Awards were announced Sunday 18 May 2008 at Keycon 25 in Winnipeg. Congratulations to Hayden Trenholm, whose story “Like Water in the Desert” won Best Short-Form Work in English. Hayden is a really nice guy and a heck of a competitor. He wrote a great story and definitely deserves an Aurora. And watch out next year when his first novel, Defining Diana (Bundoran Press), will be eligible in the Best Long-Form Work in English category. Hayden Trenholm, David Livingstone Clink, Douglas Smith. However, I’m thrilled to be associated with an Aurora Award by proxy, because Julie E. Czerneda & Jana Paniccia won the Best Work in English (Other) Aurora for edited Under Cover of Darkness! Yay! Congratulations Julie and Jana! I had my first published story in UCoD and I’m thrilled that they won for their excellent work! A well-deserved accolade!